Blades marked STAINLESS ITALY, handles apparently unmarked but appear to be solid silver. Length 7". No monogram. Overall and mark condition are excellent. 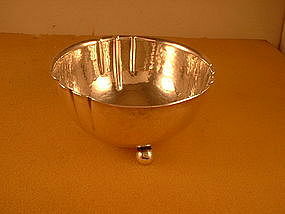 Silver marked 925. 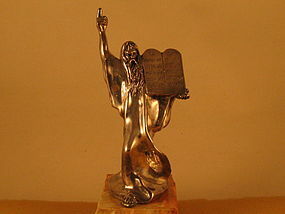 Full length silver statue of Moses with raised right arm, left arm holding two tablets of 10 Commandments (in Hebrew? ), also a six-point Jewish star at the top of each tablet. On a stone base bearing label Ben-Zion/Israel. Felt on base. Overall and mark condition are excellent. Marked 925 and CU(? ), each in a cartouche. Mint condition. Turned wood handle. Length 10-1/4". Length of head 3-1/4". Width of head 1-3/4". The perfect gift for the retiring chairperson or president of an organization. Marked MEDICO STERLING. Also narked M in a shield on the plastic stem of the pipe. Figural overlay,pierced. 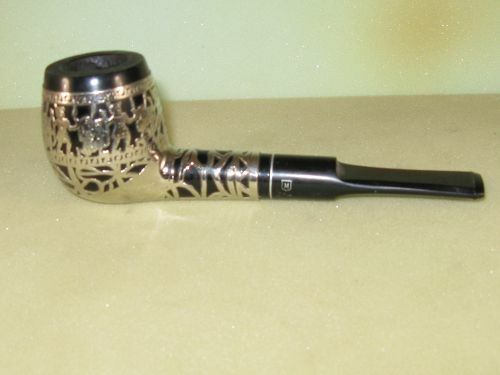 Length of pipe 5-3/4". Length of silver overlay 2-7/8". No monogram. Overall and mark condition are excellent. 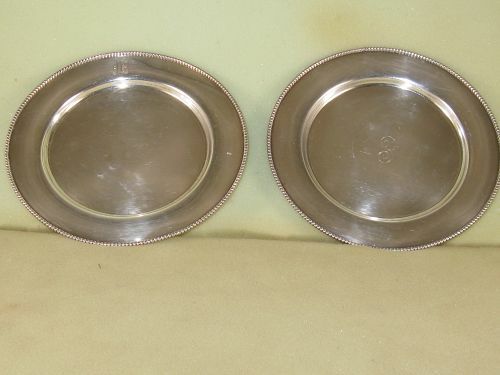 Marked SHREVE & CO. STERLING. Length 5-1/2". The monogram is a lengthwise script GCP. Overall and mark condition are excellent. 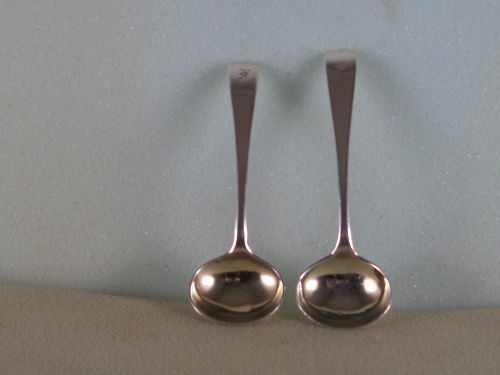 Pair of English salt spoons,20thC. Maker P(pellet)J in an approximate rectangle. Downturned handles,rounded end,drops,lightly tipt on the backs. Length of one is3-15/16", the other 3-3/4" (but same marks and monogram). Overall and mark condition are excellent. By Shreve & Co., San Francisco. Hammered finish, applied top rim. Diameter 5-13/16". Weight 3.3 troy ounces. The monogram is a block LAK. The overall condition of the plate is excellent. Published 1976 but in new condition. Hardcover with dust jacket. 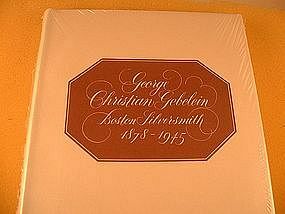 Biography with many references to history of Arts & Crafts silversmithing in the Boston area. 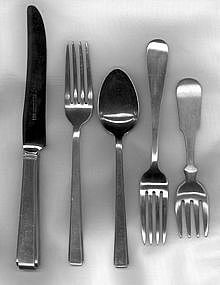 Many forks, some knives and spoons. 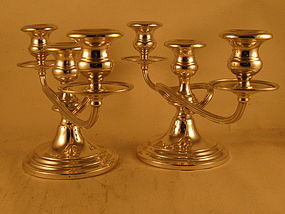 Some hand made by Gebelein, others major manufacturers. Set illustrated is by Lunt. 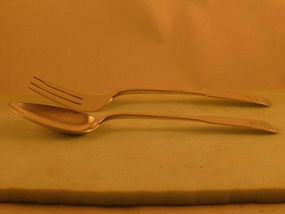 Forks illustrated were hand made by Gebelein in the 1930's, still in mint condition. Edge divided into 3 segments. On 3 ball feet. 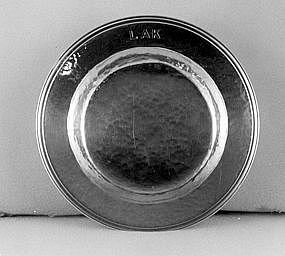 Diameter 4-1/4". Height 2-1/8". Weight 7.1 troy ounces. No monogram. Overall and mark condition are excellent. In form of large thimble. 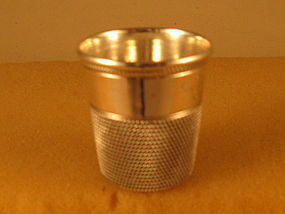 Inscription on side: ONLY A THIMBLE FULL. No monogram. Overall and mark condition are excellent. Height of side lights 6-1/8". Maximum horizontal dimension 12-3/4". Base diameter 4-3/4". Bases weighted for stability. No monogram. Overall and mark condition are excellent. Fiddle, rounded end. ONC Moulton pattern. 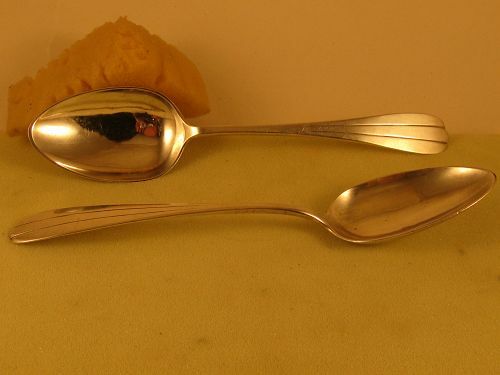 Two-tine fork, spoon with narrow bowl. Length 10-1/4". Total weight of both pieces 5-1/4 troy ounces. The monogram is a script KG. Overall and mark condition are excellent. Downturned fiddle, rounded end. 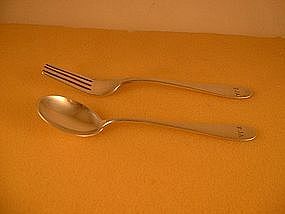 Fork has 3 tines, the outer ones shaped. Length 10-1/4". Total weight 5.6 troy ounces. 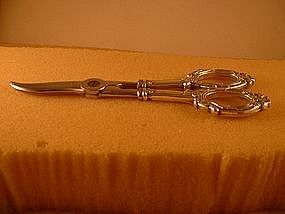 The monogram on the top of the handle is an Old English F.
Lotus pattern? Length 8-5/8". Weight 2.1 troy ounces each. The monogram is a block W/I P. Overall and mark condition are excellent. Upturned handles. 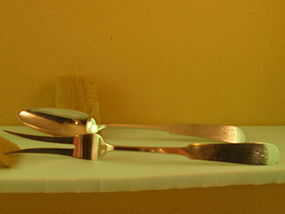 Length of fork 6-1/8". 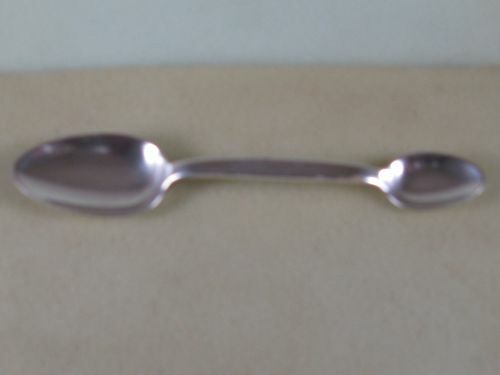 Length of spoon 5-1/2". Weight of the two pieces 1-3/4 troy ounces. The monogram is RJA (could be removed). The mark is STERLING PORTER BLANCHARD, both sterling and the name in an ellipse. Mark and overall condition are excellent.